Since Game-Master Cris’ game turned out to be so lethal Isis, Jenn, and I had to generate new characters. I decided on a ratling male. 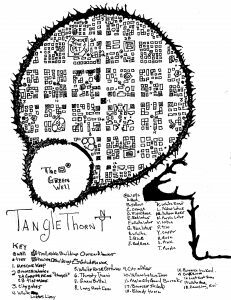 We were still playing in an “evil” campaign in the Poisonwood city of Tanglethorn. I dubbed my new character the ratling Fourthborn Afheeshh the Nervous. He is a thorn runner ratling native to the Thorn Ring, a dense wall of thorn-vines that bounds the city. His hair is light brown, matching the thorns, has light blue eyes and what skin is exposed is fair. He is a chaotic evil scrupulous character with Quickling as his class. His weapons are custom versions of Psi’s. They have a thin but sharp blade allowing for a slashing weapon that can stab and hook. Afheeshh’s disposition is hotheaded, quick tempered, emotional but basically nice. His flaws are Shy and Jumpy. Isis decided on a ratling male Canny-Jack named Wufcor and Jenn a human female Duelist named Pabstcan (exasperated sigh). Both were natives of the wretched city of thorns. 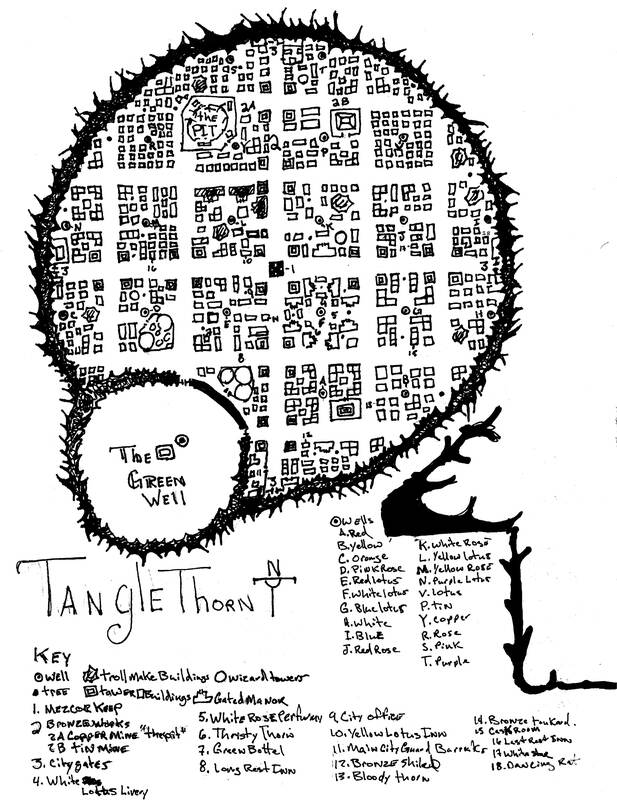 The city of Tanglethorn has been under the thumb of one Lord Ebikom for the last two and half years. Rumors that the city lieutenants are planning a coup were circulating. There was tension in the air and the filthy streets were a network of raw nerves, no one wanted yet another violent political upheaval. The two ratlings and the duelist were sitting at a badly stained and damp table in a crowded smoke filled saloon called the Caskroom. The dregs of the city packed the place along with small groups of the two local beggar-gangs, the Twisted Horns and the Broken Dirks. In addition to them, there were two other local street gangs, the Bronze Boys and the Troll Boys, facing off over an undeclared drinking contest. Wufcor was picking at the table with his dirk in anticipation of a brawl. Pabst was “hanging tough” by the table downing her jack of frothy ale, it had cost her the last coin in her purse. Afeesh (how those round the table pronounced it and it is easier to spell) was watching the two cliques as they grew increasingly hostile to each other. It took about an hour before both parties stood and walked outside to “handle it”. The three pulled their weapons as they passed between the still swinging saloon-doors following the angry gang members outside into the street. Tabletop Meditations #19: Murder Hoboes Inc. Your player group has just slaughtered an entire village for the hell of it, they kill every other NPC that has any words with them, and they loot every corpse. In fact, loot is just one excuse they use to participate in the slaughter of unfortunate NPCs. What you have on your hands is every GM’s nightmare, a gaggle of Murder Hoboes. The problem of murder hoboing is as old as fantasy roleplaying games themselves. A problem best dealt with directly in-game though out-of-game preparation can help to mitigate its appearance. The term itself comes from the commonality that most adventurers are essentially homeless wanderers looking for wealth and power through fighting enemies, participating in expeditions, and general adventuring. 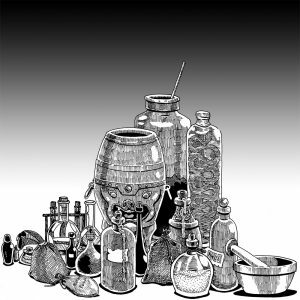 Murder hoboing is a problem because it can derail an adventure by killing off of important NPCs thereby disposing of any important information they were to relay to the PCs, cause utter chaos in game rendering all the prep work a GM has done fruitless, and may squelch the fun of those actually trying to engage the game world. Ultimately it rests with the GM to work with the offender to get things back on pace. However, direct confrontation might not be the best or effective way to go about things instead attempts from within the game should be tried first to gently coerce the Player through their character. Every group has had a player that has done this and often groups do go through these types of phases early in their existence. However, not all adventurers are Murder Hoboes though the majority seem to be itinerant by their very nature. A Murder Hobo is essentially an adventurer that simply goes around killing everything in their path in order to reap experience points (XP) or to loot the corpses of their victims. They often do not discriminate between villains, allies, monsters, animals, innocents, and criminals. If it exists within the game, worth is broken down into loot or XP. On the other hand, Murder Hoboing is the behavior manifesting from the previously mentioned outlook by a Player using their Player Character (PC). A player may hold this simplistic view due to boredom, a long lull or inactivity in the game, or lack of immersion leading to said boredom. This can also come from playing a character that has been built solely for combat and nothing more in a game that consists of little or no combat or has long stretches between the actual fighting and the other RPG elements. There are three major strategies or courses of action that can be used to mitigate murder hoboing that do not directly target the Player. The first called the Session Zero approach strives to construct a set of rules and understanding that will set up the boundaries for Players and the GM. This is a preemptive strategy. The second strategy is to require a Backstory from each Player for their character in an effort to invest the Player in the fate of their character. Hopefully inspiring them to not misuse them to derail the game. The last approach is to Bait the offender and essentially use the potential fate of their character to send a warning to them that their attempt at having fun stomping all over everybody else’s’ will only end in frustration for them. This is still an indirect approach but is very close to being directed at the player him or herself and if misused that is exactly what it will feel like to them, so use this last approach with caution. Session Zero is the pregame where the group gathers to generate characters and where the general rules and expectations of the group can be discussed establishing a general code of Player behavior. The GM can give their input in character builds so that players can create characters that can participate in as much of the play as possible thereby avoiding the boredom and over-specialization that can lead to the adoption of the murder hobo mindset. Typically, a Session Zero is a meet up to generate characters and discuss table manners before the next actual play-session. This preliminary session also gives the players a chance to come up with and write backstories for their characters. Players that have worked on a backstory will have more invested in their characters. Thus, they are less apt to go on uncharacteristic killing sprees or randomly murder NPCs. Granted that their character is not actually a homicidal maniac. A backstory also allows a GM to integrate a character into the game world and even into the main thrust of a campaign by linking elements in their backgrounds with adventure and campaign elements. This also gives the GM ammo when a PC does go berserk and needs to be reined in allowing for in-game story options to do that if only as a distraction. This brings us to baiting. This strategy involves using a situation or NPC that appeals to the worst nature of the Player(s) in order to lure them into a confrontation. The bait of course is much more than can be seen, they are characters designed to prey on the weaknesses of the offender(s) as well as defend against their strengths. Either this forces the offender’s compatriots to join them or back away during the fight. If they survive that encounter then bait them again to send a warning shot across their bow in order to let them know they may not be able to tell a bait-NPC from the average NPC. Whereas the previous strategies do not directly target the offending player(s), remember the bait tactic means the player(s) has to take it, there are effective strategies that do. These techniques directly oppose the PCs in game and if over-used may cause players to resent the GM. They may come to believe the GM is laying tracks (as in railroading) or just deliberately beating up on their characters, so try not to over-use these techniques. I suggest that these strategies should be utilized when the characters start exhibiting or carrying out murder-hobo behaviors. These tactics are the Boss Strategy, making use of diegetic Power Structures, and deploying an Avenger. A one time-tested strategy to handle murder hoboing has been to insert increasingly powerful NPC’s (paladins are common) to act as adjudicators and avengers essentially using the Video-Game Boss Strategy. A boss in this context is an NPC that functions as a roadblock to the endeavors of the players. Sometimes they can also function as a landmark, especially as an indicator of player power level. An example is an NPC showing up early in the PC’s career that beats the hell out of them and gets away. Eventually the PC’s catch up to this NPC and are able to defeat them in a later confrontation allowing players to demonstrate not only their characters’ increased powers and abilities but also (hopefully) their better teamwork and maybe ability at planning and strategy. Bosses are ideally effective combatants up to the point of defeating the players, that is they are hard to defeat but are not overwhelmingly or impossible to knock down. The Boss strategy can keep the murder-hobo(es) on their toes focusing their attention. It also has entertainment value so eliminating murder hoboing due to boredom. The Boss should inspire the PCs to track them down where NPCs with information become important to that goal. A murder hobo would lose the ability to get their claws into the Boss by not sparing the “throw-away” NPCs. A better strategy, one that increases the depth of the setting, is to impose a socio-political hierarchy (feudalism etc.) that is defined and useable in game with the NPCs holding these positions not having to be super-charged or even particularly unique. The structure will ensure that even the players eliminate those in charge there is always a replacement and all the powers above them will see the players as threats to their persons as well. Thereby hiring and sending out the boss-types not only reinforced with the authority to deal with them but with back-up coming from all angles which includes ordinary citizens as informants or even poisoners or entrappers. These people who not only believe in the system which can by themselves be enough but those who also have stakes built into the system or at least those who believe they do are very dangerous. Overarching structures are more effective being very big and complex such as the Feudalist Hierarchy, which is basic but can be complex very quick as can succession to any of its offices. Smaller self-governing structures such as Guilds are more common but are also attached in some way to the overarching political structure by agreements, contracts, laws, and money. Meaning certain parts of the system will awaken to protect the whole as well as those parts that will see the murder-hoboes as their answer to political expediency and try to use them as such. This method can turn murder-hoboes into true role-players very quickly especially if they care anything about their characters. If the PCs still randomly murder the NPCs then an avenger may be called for. An Avenger or Nemesis type NPC has the power and resources to hunt down and be a definite threat against the offending PCs. This type of NPC will definitely try to get them alone in a duel-like situation and will have no mercy convinced that they are the good guy and may very well be in this situation. It should be obvious to the Players that this character is too powerful to confront directly and there should be clues dropped in the game to demonstrate this and clue the Players in. There should also be in-game moments when the PCs know a superior enemy is stalking them. This helps to focus the murder-hobo(es) on something other than murder hoboing. Murder Hoboing can drag a game down into pure boredom with the GM paralyzed due to a vital tool being broken. The ability to put clues and raw information into the mouths of NPCS is extremely important to running a game. 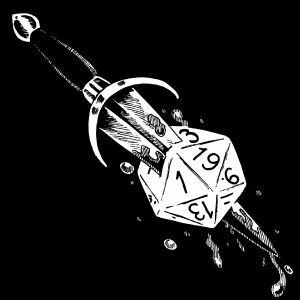 It also boils roleplaying games down to simple number crunching as murder hoboing often involves greed for XP but this is not always applicable. However, there a ways to mitigate and fight this lazy approach to RPGs that some players have or may fall into. The more passive and preventative approaches are running a preliminary session (Session Zero), require character backstories from each player, and do not be afraid to bait troublesome player characters. These should be attempted before the more direct methods are used. The more direct methods to combating murder-hoboes are employ increasingly powerful NPCs as adjudicators, make use of in-game power and political structures, and sending out avenger or nemesis type NPCs directly at the PCs. Note that the GM should never overuse these direct tactics as players may take it as direct attacks on them by the GM, so use sparingly. Of course, if all else fails maybe it’s time to let go of the troublesome player or try to adjust to the group’s method of play if it is the entire group and a new one is not an option. Maybe such a group is better at being the villains.